Another birthday, this time my friend Jerry. What to make for a guy who has no dessert favorites but is happy with everything? 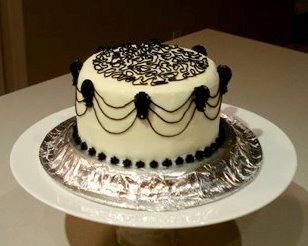 Last year I made him a black and white cake (see photo below). This year, I went with another black and white cake, but in cupcake form. Plus, I’ve been wanting to make a cookies and cream dessert for a while! See the verdict at the end of the post! 1. Preheat oven to 350 degrees F. Line a cupcake pan with 12 liners. a. Twist 12 Oreos in half and place the side with cream on the bottom of the cupcake liners (cream side up). b. Cut other half of cookies for later decorations. Crush the others into a fine crumb to add to frosting. c. Roughly chop 10 Oreo cookies and toss in 1 Tablespoon of flour. Set aside to fold into batter. 3. Whisk 1 1/8 cup flour, baking power, and salt in a bowl. Set aside. 4. In a separate bowl, whip egg whites to soft peaks. Gradually beat in ¼ cup sugar until stiff peaks. Set aside. 5. In a separate bowl, cream butter and ½ cup sugar until fluffy. Add vanilla and beat to combine. 6. Add flour to butter mixture in thirds, alternating with buttermilk, starting and ending with flour and beating between additions. 7. Fold in egg white mixture. 8. Fold in chopped Oreo cookies. 9. Spoon into cupcake liners and bake for 20 minutes or until a toothpick comes out clean. Oreo in the cupcake liners. Cut the twisted off cookie in half for decorations. Chop 10 Oreos to fold into batter. In a large bowl, combine 1 cups of butter (softened), 4 cups of icing sugar, 2 teaspoons of vanilla syrup, and 1/4 cup of milk. Beat until smooth. Add crushed Oreo cookies (about ¼ cup) and beat until combined. Wow, these look really really good! I have to admit that I'm not big on Oreos, but I bet the cupcakes these would be great anyway, or with chocolate chips! Hi, my name is Erica. My mantra is to cook with whole ingredients…except for when I bake! I think we all deserve a treat every now and then! You can reach me at tast.e.baked@gmail.com Hope you enjoy your visit!